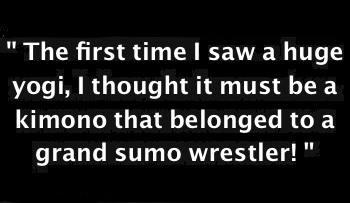 What was a Japanese yogi? 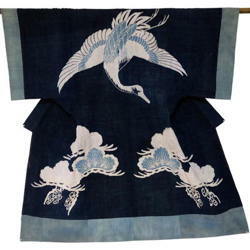 It was a thick, warm cotton garment shaped like a very large kimono. It might be worn by one or two people while sleeping on a futon on cold winter nights. Think of it as an overstated kimono tailored from a Western style blanket or better yet, a comforter. Yogi cotton sleeping garments first gained noticeable popularity in Japan in the early Edo period (1615–1868). This was an era when domestic cotton cultivation became relatively common in Western Japan. At the same time, rural cottage industries took on the tasks of spinning and weaving cotton into quantities of fabrics that ended up being fashioned into clothing and household textiles for the majority of Japanese families. 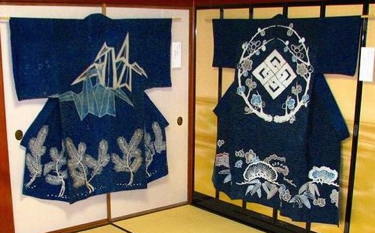 Until mass production of soft cotton grew widespread, the Japanese commoner had to use cultivated bast fibers (asa, mostly hemp) to process into cloth and to fabricate it into clothing and other textiles. They were typically coarse and unpleasant to the touch. Luxurious silk was subject to strict sumptuary laws that restricted it to the exclusive use of the aristocracy (samurai class). 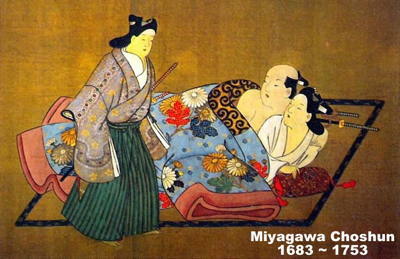 The Japanese determine that cotton cloth possessed all the perfect characteristics for making very comfortable yogi sleeping garments so that a married couple might snugly fit within it during cold winter nights. Cotton fabrics were highly desirable because ordinary Japanese found them easy to care for and pleasant to wear all of the year. Homemakers joyfully discovered that in hot, humid summer weather, cotton fabric had the capability to breathe and as a result, when the body perspired, cotton fibers were able to release the moister so that it readily evaporated. And, the fact that in cold weather, cotton fibers were able to absorb and retained the body’s heat was a dearly beloved benefit. The yogi was patterned after a summer cotton summer kimono (yukata) and looked like an enormous kimono. It consisted of an exterior fabric with an interior lining and a thick pad of cotton wadding (batting) that was sandwiched between the two textile layers. Often wealthier parents of a Japanese bride gave to their daughter an elaborately decorated yogi as a treasured element of her wedding trousseau. To begin the process of making the yogi, the parents first purchased homespun, hand woven cotton material and then engage a tsutsugaki craftsman to create and dye meaningful motifs onto the exterior fabric. The parents wanted the artisan to create inspiring themes that declared the hope for a favorable life for their daughter and her husband. The meticulously dyed tsutsugaki images were designed to convey good wishes, a desire for a happy marriage and to encourage the gods to provide an auspicious future for the young couple. The bride’s mother was responsible for sewing the parts of the yogi into its final form. 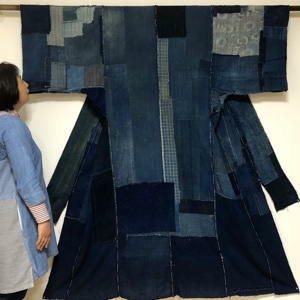 First, she had to hand stitch the 13 inch (34 cm) wide material together correctly so that the tsutsugaki dyed design elements lined up accurately. Then, she stitched the liner onto the exterior fabric. And, finally she stuffed the cotton wadding between the layers. A yogi was bulky and heavy (think of them as a tailored comforter) and it might measure 3 ~ 4 inches (5 ~ 7.5 cm) thick and weigh 15 ~ 25 lb (7 ~ 11 kg). In order to properly insure the maximum lifetime of the yogi, the homemaker had to regularly remove the cotton wadding and then wash and repair the fabrics. 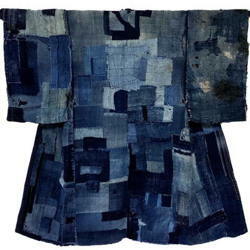 She meticulously sewed fabric scraps over threadbare and torn sections, often securely fixing the patches with elaborate sashiko stitches. The last step in the maintenance process was to stuff new cotton wadding into the yogi. Over time and much use, the garment turned ragged, especially the linings. Many of these yogi, particularly the liners, became known as boro textiles due to the considerable and frequent mending that they endured. Yogi sleeping garments will be perpetually celebrated in Japanese culture as a fascinating curiosity thanks to their appearance in works of art, notably they show up in ukiyo-e woodblock prints and in book illustrations. Married couples and courtesans with clients were pictured wearing yogi in romantic settings, often in sensual circumstances. Today, folk textile collectors consider yogi sleeping garments valuable examples of Japanese cultural history because they represent a nostalgic bygone era, not to be experienced again. A yogi makes for a stunning and visually dramatic display or presentation of a Japanese cultural work-of-art, perhaps best exhibited on a wall.